The Women's Wellness Connection at the Colorado Department of Public Health and Environment contracted with JVA Consulting to better understand how to communicate with WWC providers and clients. JVA conducted qualitative research in 19 Colorado counties representing urban, rural, ethnic and racial diversity. 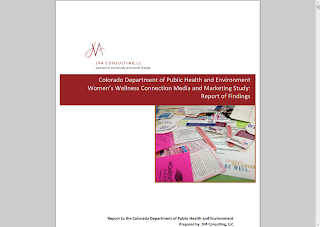 JVA research highlights the most effective marketing tools and outlets for WWC and recommends next steps to ensure all women in Colorado who could benefit from the WWC breast and cervical cancer screening program know their options and are better informed about cancer screening and preventative care.